There is just something utterly special and inspiring about this image. 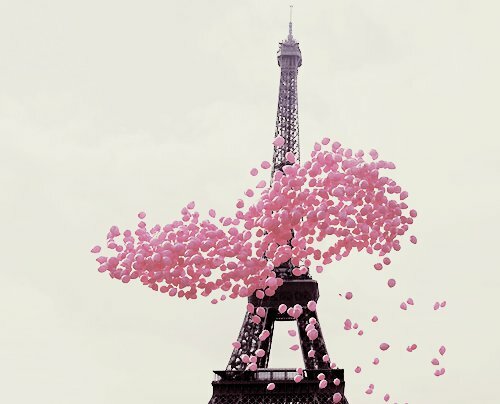 Aside from the undeniable urge to board a plane for Paris and fly off to see The Iron Lady in person, the Eiffel Tower is synonymous with anything romantic. And and image showcasing the inclusion of numerous pink balloons encasing her in a whimsically protective shield adds further grace and fancifulness to The Iron Lady. It also brings back fond memories of when I first travelled to Paris. The Iron Lady was once considered to be an eyesore, but is now classed as an iconic work of art. She was erected to commemorate the French Revolution and only intended to remain standing for a mere twenty years. Yet Gustave Eiffel managed to persuade otherwise. And thank heavens for that. For what is more iconic and recognisable then the glorious Eiffel Tower? When one thinks of Paris or even romance, then I guarantee images of The Iron Lady is immediately conjured. She is perpetually showcased in film and photography. And even inspiring fashion designers such as the late Alexander McQueen. She is the most visited site and monument in the world and essentially on the majority of people’s travel bucket list. And almost always one of the first things one aims to visit when you get to the city of Paris itself. You can climb her or take an elevator up north. You can dine with a view too. There is also a hidden apartment calculating Mr Eiffel included in the design but kept secret for many moons. An apartment which was closed off from the public until recently. For me I adore how The Iron Lady stands effortlessly tall and proud in the Champ De Mars. The filigree in the Eiffel Tower’s ironwork is just as enchanting up close and personal. Undeniably holding the best view’s of the city, in and around her presence, which is unmistakably magical.